Organizers of the Commerce Bank Triple Crown of Cycling have announced the 25 professional men's teams that will wage a three-race battle on the hardscrabble streets of southeastern Pennsylvania in early June. To the victors will go the lion's share of a $93,500 prize purse that includes a $10,000 bonus for the overall series winner. Battling for the cash will be a deep field that includes four teams slated to start July's Tour de France, the Danish-based CSC formation, Italy's Liquigas and American powerhouses Team High Road and Slipstream-Chipotle. But this is not necessarily a harbinger of a one-sided affair. Home-grown teams such at Toyota-United, Health Net-Maxxis and Pennsylvania's own Rite Aid squad will surely do their best to topple the big boys. Also be on the watch for cycling's new bad boys, Rock Racing, which boasts a marquee team roster that includes the likes of ProTour veterans Freddie Rodriguez, Tyler Hamilton, Victor Hugo Peña and recent Redlands Classic winner Santiago Botero. "The Rock Racing team has a brash approach that's sometimes controversial," explained Pro Cycling Tour president David Chauner. "But they also have a stacked team and their owner is an enthusiastic guy who wants to make an impact on the sport. We like that." Indeed, Rock Racing boss and fashion mogul Michael Ball will be just one of the many characters that make the 2008 Commerce Bank Triple Crown of Cycling a must attend sporting event. The three-race series commences June 3rd with the Commerce Bank Lehigh Valley Classic, an 85-mile, 12-lap circuit race that traces a twisting path through Allentown and Salisbury Township. Two days later, the race caravan will relocate to Reading for a 75-mile, 11-lap affair that darts back and forth between the city's downtown and nearby Mt. Penn. 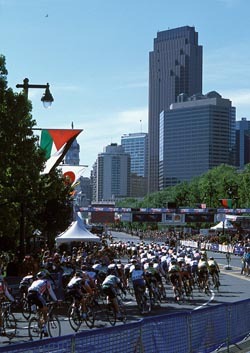 Finally, comes the big daddy of North American one-day races, the Commerce Bank Philadelphia International Championship. Celebrating its 24th running, this epic 156-mile test of mettle begins and ends on Philadelphia's famed Benjamin Franklin Parkway. In between a fast field of the world's 200-plus best cyclists will fight and claw their way around 10 laps of the 14.4-mile primary circuit that includes the infamous Manayunk Wall, which boasts precipitous grades in excess of 17 percent. That's followed by three testing finishing circuits up and over Lemon Hill before the 2008 champion is crowned. "What sets these races apart is that they are circuit races held in the heart of big cities, not long point-to-point tours where you may only see the riders once all day," added Chauner, a 40-year veteran of the sport, two-time Olympian, and 1998 inductee into the U.S. Bicycling Hall of Fame. "Our events allow you to see the strategy and tactics unfold right before your eyes. It's NASCAR on bicycles." And just like NASCAR, all three events will garner expanded live television coverage, a testament to excitement the Commerce Bank Triple Crown of Cycling will unleash during the first week of June.